Essen is a city in the Ruhr area (North Rhine-Westphalia, Germany) with approximately 576.000 inhabitants. Together with the other 52 cities and communities of the Ruhr area - the third largest urban agglomeration in Europe - the immediate surroundings of Essen are inhabited by about 5.3 million people on a surface of roughly 4.500 square kilometers. 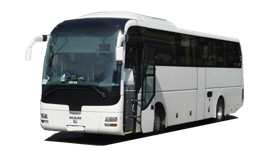 Via the "Essen Bus" website, the european tour operator City Tours proposes bus rental service for anybody who wishes to rent a charter coach or a minibus with driver for sightseeing tours, excursions and transfers by bus in Essen, in the Ruhr area and anywhere else in North Rhine-Westphalia as well as for international bus transfers across Europe. Among other charter bus services, the motorcoach rental company Essen Bus proposes to rent out modern and comfortable minivans, minibuses, coaches and buses with driver for city tours to Essen, bus transfers in Essen, sightseeing tours within the Ruhr area and to other parts of North Rhine-Westphalia as well as for guided tours to many german cities including Bochum, Dortmund, Duisburg, Gelsenkirchen, Hamm and Oberhausen. Thanks to a close-knit co-operation with the european tour operator City Tours, Essen Bus can also provide charter buses for coach tours across Germany and entire Europe and take care of all related tourism service, including hotel reservation, group menu arrangements, tour guide booking and ticket reservation for shows and events.
. With pleasure will we provide you with a tailormade charter bus rental offer for your transfers and sightseeing tours in Essen, in the Ruhr area, in North Rhine-Westphalia or elsewhere in Germany!